Virtual graphics may be the next big thing in sports production, but, to deploy the new technology effectively, the key is context. Besides showing the distance of a home run was hit, a competitor’s heart rate, or the force of a boxer’s punch, the graphics must demonstrate why each metric is important, relevant, and essential to the story being told. 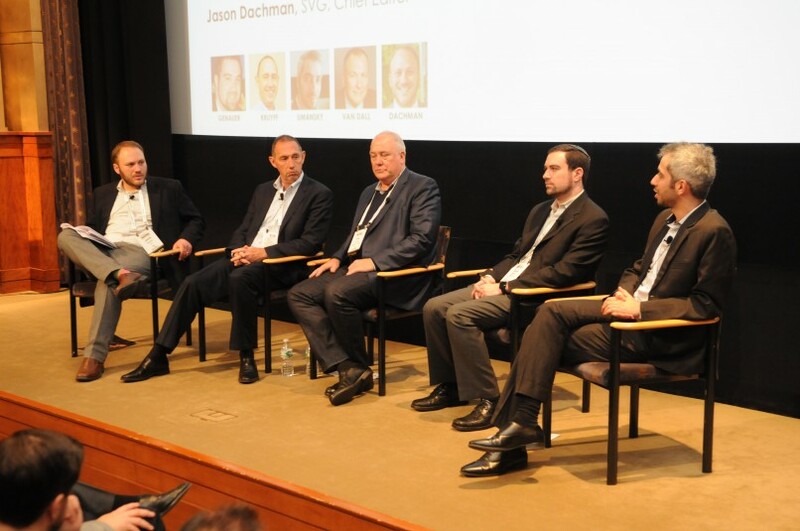 MLBAM VP of Multimedia Strategy Dirk Van Dall kicked off a panel discussion on virtual graphics at last week’s Sports Graphics Forum in New York City with a look at Statcast, explaining how the player-tracking and visualization platform has evolved since its introduction last year. From left: SVG’s Jason Dachman leads a discussion on virtual graphics with deltatre’s Kruyff, MLBAM’s Van Dall, FMProduction’s Genauer, and Avid’s Umansky. The need for context stems from the torrents of data being produced. With so much data available at any given moment, broadcasters must discern which pieces truly advance their story or risk drowning in endless statistics. Jan Umansky, senior market specialist for graphics, Avid, recalled a time when the graphics infrastructure was configured to consistently ask for and pull in data. FMProduction Director Rami Genauer discussed how FightMetric, the mixed-martial-arts–statistics and –analysis provider — takes the onslaught of data produced by biometric and embeddable sensors to “quantify the visible”: in other words, provide context to what the viewer sees during a fight. He believes the next step is to show what viewers can’t see: heart rate, for example. Biometrics, Genauer continued, helps to keep the focus of the broadcast on the individuals competing and remind viewers that they are watching actual people. External metrics — speed, distance, force — might not make this as apparent, but the panelists stressed that they also add interest to the story. Even new and never-before-seen metrics, if presented clearly and within the context of the overall story, can enrich the broadcast. When it comes to deploying virtual graphics — whether player tracking, 360-degree replay, or augmented reality — less is more. Just because the technology exists does not mean that it can, or should, be used whenever possible. Rather, the panelists urged broadcasters to limit their use (“Reduce, reduce, reduce is definitely the way to go,” said Van Dall) in order to maximize the impact.